NYCDailyDeals -- What's Free And Cheap In New York City Today: Party Time! 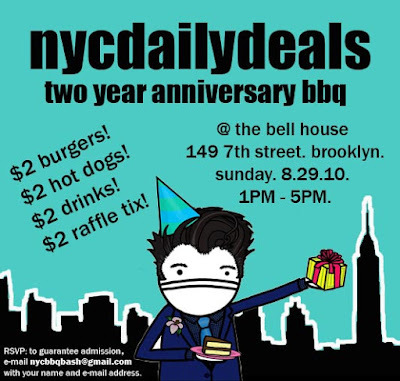 NYC Daily Deals Two Year Anniversary BBQ! Party Time! NYC Daily Deals Two Year Anniversary BBQ! NYC Daily Deals is turning two! And to celebrate, we’re replacing our pacifiers and baby bottles with some barbecue and beer. We'd like to take this opportunity to personally invite each and every one of you down to The Bell House on Sunday, August 29th from 1PM – 5PM. We’ll be grilling up $2.00 burgers and hot dogs... and if you get thirsty, select drafts and well drinks will be just $2.00 too! Get it? Everything is just $2.00 for our two year anniversary! DJs will be spinning tunes so awesome you’ll be instantly cured of the Bieber Fever that infected you earlier this summer. Plus, there will be a raffle with so many prizes, you’re nearly guaranteed to win! To ensure admission, send your name and e-mail address to nycbbqbash@gmail.com. Stay on the lookout for more information, including details about what raffle prizes will be up for grabs. But in the meantime... mark your calendars! We hope to see you there!